Rachel Hollis is the founder of a tremendously popular and successful lifestyle blog targeted at women. 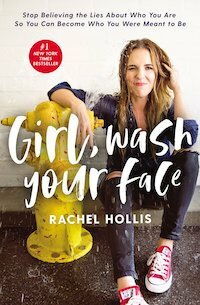 Though she has written a few novels and cookbooks along the way, Girl, Wash Your Face is her first non-fiction work. The conversational, friend-to-friend tone that marks her blog is apparent from the opening pages, and she wastes no time telling what it is all about: “This book is about a bunch of hurtful lies and one important truth.” That sounds positive since it’s clear that as human beings we are prone to believe lies about ourselves, about others, and even about God. Here Hollis defines happiness as contentment, optimism, and gratitude, and says it is displayed in fun and laughter. A happy life looks to other people like a perfect life, one that is worthy of Instagram. It means enjoying life 90 percent of the time. Though Hollis has experienced great pain and anguish, she has still managed to build this kind of happy life and means to tell others how they can do the same. Now, what is involved in achieving happiness? “You need to identify—and systematically destroy—every lie you’ve told yourself your whole life. … Recognizing the lies we’ve come to accept about ourselves is the key to growing into a better version of ourselves.” A woman’s happiness depends upon how she responds to the multitude of lies surrounding her. This is why the book is framed around 20 lies women believe about themselves. In almost every case, Hollis describes how she once believed this lie and how she improved herself by overcoming it. If the key to the good life is becoming happy and if happiness depends upon overcoming lies, what rule or standard is there to help women distinguish truth from lies? She is never clear on this. She never directs her readers to a single source, guide, rule, or book meant to serve as an authoritative source on what women ought to believe and disbelieve about themselves. Instead, women are left to create their own standard according to either their own criteria or Hollis’s. If we can identify the core of our struggles while simultaneously understanding that we are truly in control of conquering them, then we can utterly change our trajectory. God, your partner, your mama, and your best friends—none of them can make you into something (good or bad) without your help. You need to prove to yourself that you can do it. You need to prove to yourself you are capable of anything you set your mind to. You have the power. Her call to women is to identify their inner power, then to direct that power toward conquering lies. Is there hope and relief for those who have tried to conquer lies, but failed? Hollis freely admits she has spent much of her life in this cycle of success and failure. Though in some areas she is “crushing it,” in others she is “constantly working on different angles to attack the same problem.” Her confidence is “that every day I’m learning and growing, which lets me feel at peace with myself.” To her readers she says, “Stop crying about what happened and take control of what happens next. Get up, right now. Rise up from where you’ve been, scrub away the tears and the pain of yesterday, and start again … Girl, wash your face!” Those who fail can rest assured: At least they tried, and they can try again tomorrow. Because of the author’s Christian background and publisher, you might wonder, what is the role of faith in this process of change? She says she is a Christian who believes “God loves each of us unconditionally” and that her creed is “love your neighbor as yourself.” Yet she affirms the validity of all other faiths and is clear that her instruction is equally effective for all women, no matter their lifestyle or religious convictions. Thus the book and the happy life it describes are available not only to Christians, but to all people who are willing to put in the effort.